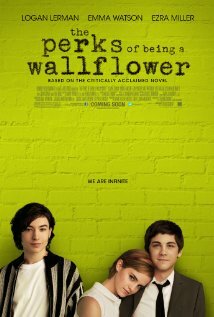 THE PERKS OF BEING A WALLFLOWER is an adaption of Stepehn Chbosky’s novel of the same title. Surprisingly, Chbosky also wrote the screenplay and directed the film. I read the novel a few years ago and I have to be honest that I found it pretty lackadaisical. Thus I didn’t go into the film with the highest of hopes. Luckily, it wasn’t as horridly contrived as I had expected. But it certainly wasn’t a piece of cinematic mastery, either. The story is about Charlie (Logan Lerman), a naive freshman, as he enters the tumultuous world of high school. He is isolated at first but eventually befriends senior Patrick and his stepsister, Sam. Through his friendship with Patrick (Ezra Miller), Sam (Emma Watson) and their group of misfit friends, Charlie suffers through the trials of loss and redemption. The story isn’t wholly original but there are some good moments. At times the film was incredibly awkward but I doubt it was intentional. The dialogue was often a pathetic attempt at witty banter. Instead of being witty, it was incredibly contrived and forced which completely removed me from the film. This is Watson’s first serious role after the Harry Potter series and her performance fell flat. Her character was incredibly insincere and a lot of her more dramatic moments were cringe worthy. Lerman was impressive as the wallflower, Charlie. His performance was a bit rocky at first but he eventually grew into the character which allowed for the nuances of Charlie to come through. Miller was probably the most entertaining of the characters as the gay, charismatic senior. Though, Patrick became more a caricature than character which hindered his development. Overall, the film was entertaining enough but I often found myself cringing. All of Chbosky’s over quoted lines (often by emotional high school females) were of course added: “I feel infinite,” “we accept the love we think we deserve,” “right now we are alive and in this moment I swear we are infinite.” It’s a story ripe with dime-store philosophies suited for the younger, angst-filled crowd. That’s probably why the book was such a hit when I was in high school. In fact, I don’t know many girls who haven’t read this book at one point. THE PERKS OF BEING A WALLFLOWER is a usual coming of age story, with some rather sappy moments and a pretty obvious ending. Charlie’s past comes full circle by the end but it’s alluded to in such an obvious way, that the final revelation is really no revelation at all. If I had a 14 year old daughter, I’d probably take her to see this but it’s not a film that I would have been interested in otherwise. 2 out of 4 stars.